The South East Coastal Ramsar Wetlands site in Jersey is one of the more unusual Ramsar wetland areas. 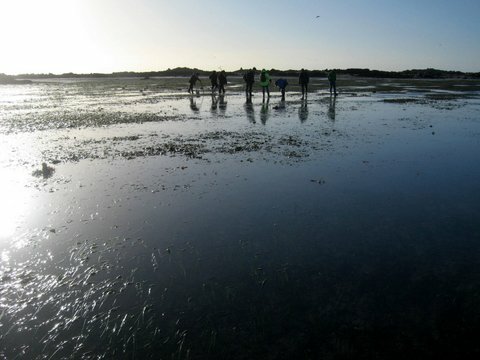 This year World Wetlands day coincided with the lowest tide of the year – ideal for Derek and Trudie Hairon of Jersey Walk Adventures to organise a seabed walk to explore this remarkable world. Jersey’s South East Coast Ramsar area was designated a wetlands site in 2000 – the first in Jersey. Jersey has tidal ranges of up to 12m. On 2nd February the low tide reached 0.4m. Whilst others sat down for lunch a small group together with a journalist of BBC Radio Jersey headed almost 2 miles offshore to Karame beacon, a navigational tower that most people only see when they pass by in a boat. 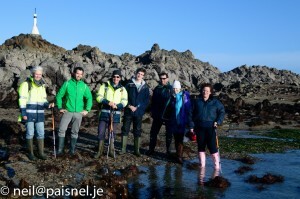 This walk is only possible on the lowest tides of the year so advance booking is essential. You’ll find dates listed here. The walks are often called “Mooonwalks” due to the remarkable landscape of rocks, shingle and sand bars, which are revealed at low tide, and a labyrinth of gullies and wide rivers. However, unlike the lunar landscape the intertidal zone is a world which is full of marine life. The walk aimed to raise awareness of the unique biodiversity of the area and reconnect people with the marine environment. Cameron from BBC Radio Jersey joined us and produced a short radio documentary of the walk which highlighted our favourite topics – as well as letting us hear what we sound like to our clients. Hopefully we did not sound to bad. 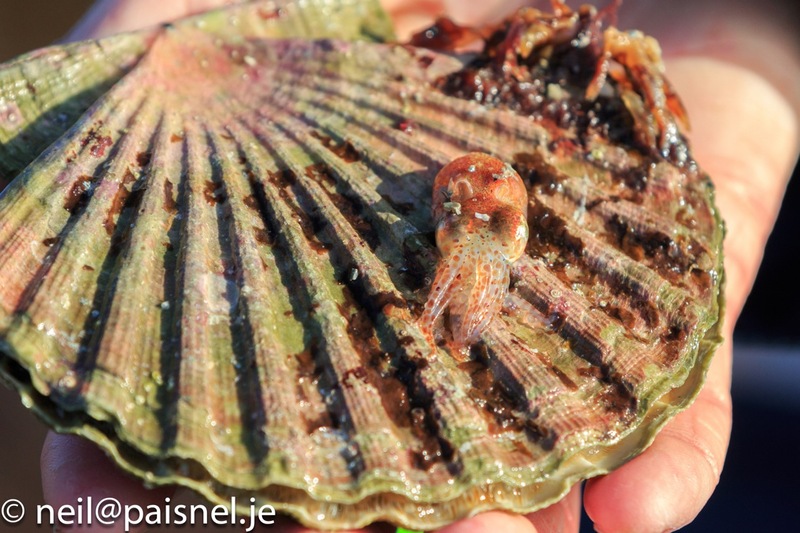 There were many exciting finds: whelks busy egg laying, a few sand-eels, blue rayed limpets feeding on laminaria seaweeds, further a tiny octopus, some scallops and numerous varieties of clams. 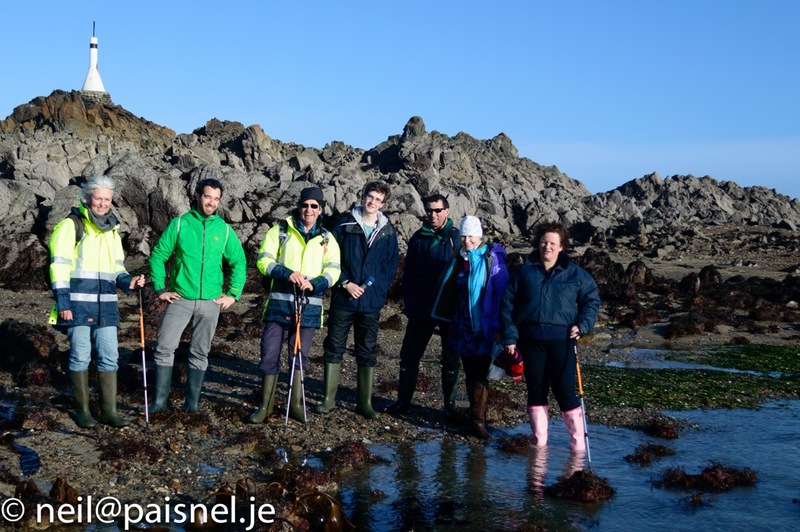 For many the walk was an opportunity to explore one of the remotest areas of Jersey and experience the islands very own wilderness. Considering how low the tide was many in our party were surprised at how few people were out low water fishing. This reveals how much we have lost contact with one of our island traditions. Go back a couple of generations and the Violet Bank would have been mobbed with islanders gathering their supper. My mother recalls my grandfather going low water fishing and popping a limpet into his mouth first thing down at the beach. He’d spend the next few hours chewing – like chewing gum – the limpet as he harvested a seafood meal for the family. 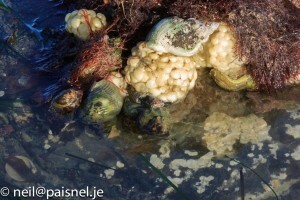 Three of our group even manged to head home with their pockets stuffed full of clams and shellfish. Enough to make an evening meal of freshly foraged food and reconnect with our traditions. The sharing of the catch took place in the nearby Seymour Inn afterwards. A short report was submitted to the Ramsar Convention World Wetlands Day website.